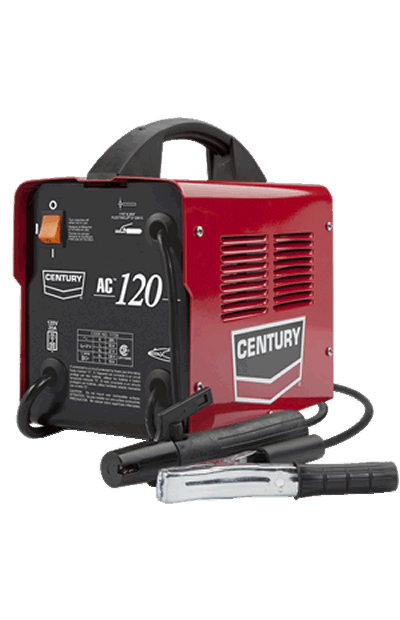 The Century AC 120 Stick Welder is compact for portability and has a 55 to 90 amp output that supports mild steel stick electrode diameters from 1/16" to 5/64". It has a 20% duty cycle rated at 55A that allows it to run 2 minutes out of each 10-minute period without overheating. It comes with a work cable, electrode holder, work clamp, and input cable with attached plug. 55-90 amp AC welding output range. 20% duty cycle at 55 amps. Dimensions of unit 11 x 7 x 11 inches. One-year warranty on parts and labor.